I have been a Long Beach marriage officiant for many years. I have officiated weddings of all kinds, including civil weddings and religious weddings, all over Los Angeles County and Orange County and in many Long Beach Wedding Locations. Some of those weddings have been at Recreation Park Golf Course, a wonderful Southern California wedding venue that you might consider for your wedding. In the middle of a sprawling 210.9-acre recreation center in the southeast section of Long Beach, the Recreation Park Golf Course offers a lovely wedding and reception venue overlooking rolling hills and lush fairways. The clubhouse has Hollywood charm, a full-service restaurant and banquet facilities for a wedding with as many as 150 guests. 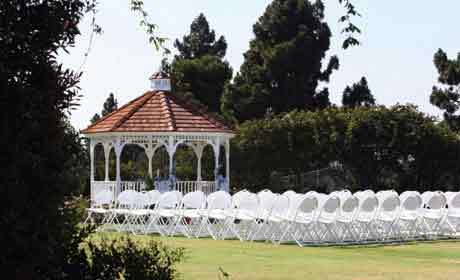 Recreation Park’s rose garden gazebo and historic clubhouse with an elegant grand ballroom provide the perfect setting for your wedding and ceremony. Numerous amenities will be provided to you and your fiance including a private bridal suite, state of the art public address system, and a variety of packages available to fit any budget. The proprietors will go out of their way to ensure that your wedding and reception are everything you imagine. Their catering specialists will be pleased to work with you as you develop your reception. Chris has been a marriage officiant for over twenty years. He’s assisted engaged couples from all of the worlds and has earned the trust of numerous engaged couples because he is, in fact, a marriage license notary, not to mention a nondenominational wedding minister, and an attorney. Phone this wedding expert right now to officiate your wedding and provide your wedding license at (310) 882-5039 or (562) 547-3255 or email here. If you are planning a civil wedding or a religious wedding ceremony and reception in Long Beach or anywhere in Southern California consider the lush venue at Recreation Park Golf Course. And when you decide upon the details of your wedding ceremony please consider this wedding officiant, the Officiant Guy, as your wedding minister.